She started knitting and crocheting for short periods and soon realized that she felt much better while knitting. 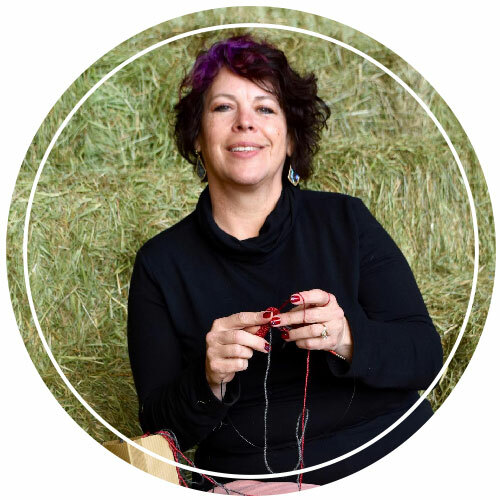 Over time, Jonna learned how powerfully the act of knitting and crocheting can heal and focus the mind. So this camp is much more than learning a skill - it’s about developing an ability that will bring a lifetime of peace, focus, and accomplishment. Friday Mini-Camp We will learn all about alpacas and how to clean and shear them. We will feel and clean their fur and will also cover the basics of knitting. Participants will knit a small towel, washcloth or hot pad. Select the dates and Knitting and/or Crocheting Camp, Mini-Camp sessions that work best for your camper. There are morning and afternoon sessions available in June and July. Morning sessions run from 8:30am to 11:30am. Afternoon sessions run from 12:30pm to 3:30pm. Hi! My name is Jonna Toth. As far back as I can remember, my passion has been to create things, primarily with fabric and fiber. I taught myself to sew when I wanted to make my own first-day-of-school outfit to start the second grade. My grandmother taught me to crochet a few years later, and that was it ... I was off and running! I started teaching knitting and crocheting professionally in a couple of local yarn shops, including currently at Everything Alpaca, here in Castle Rock.